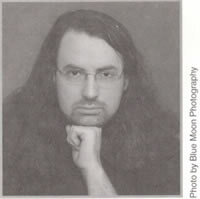 Jim Butcher is the author of the Dresden Files books and another series called the Codex Alera. Although I have only been reading his work for a few years he has quickly become my favorite author and one of only a handful of authors who I buy every release on the release day. He currently releases two novels a year, one Dresden Files and one Codex Alera novel. In addition, he releases short stories set in the Dresden Files series. This makes him one of the most prolific authors that I read. On this site, you will find my reviews of his work in the Dresden Files section. There is a section on the adventure I had when trying to get a book signed by him. Finally, because this is a college project, there is a section on which resources I used to create this page.